My boyfriend and I are pretty horrible grocery shoppers. We always attempt to hit the grocery store to buy "meals for the week" but that meal planning quickly takes a complicated turn when we end up in discussions on what food might still have available in the house to contribute to that meal. The end result is we often end up with too much of one thing and not enough of another. Yes, we could come up with a list and check our supplies ahead of time, but that while awesome in theory never quite works out for us in practice. We've learned that we're not grocery list people, and even when we try to be we end up straying pretty far from what we "plan" on picking up. It's certainly not a perfect solution. 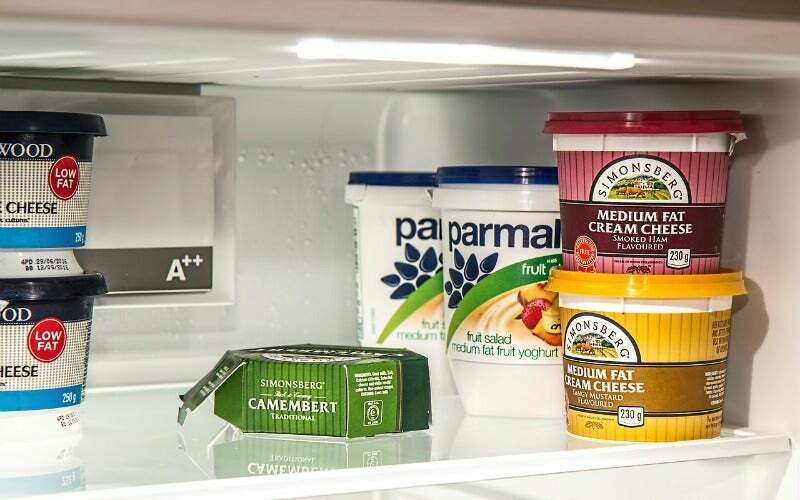 Depending on how crowded your fridge is you might not be able to see everything that's in there, and you won't be able to see inside the packaging to know that you have 2 eggs left in that carton or a few drops of milk. That said, it's not a bad idea. A photo can give you a frame of reference for your house and help jog your memory about what you have and what you might be on the verge of running out of. While you might not be able to see that your container of coffee creamer is running low, seeing its picture might remind you that you almost used the last of it this morning. The best part? Taking a pic only takes a few seconds. For the lazy man (or lady) who doesn't want to make a list and a plan ahead of time, it can be a useful reference to determine if you should grab that item that's on sale.